Russian scientists together with colleagues from UK, Spain, Brazil, Japan and Austria have fully described the mechanism of fungal luminescence. They found that fungi utilize only four key enzymes to produce light and that transfer of these enzymes into other organisms makes them bioluminescent. Some living organisms can glow due to special chemical reactions taking place in their bodies. Such organisms are called bioluminescent; they include fireflies, jellyfish and worms, among others. They use this ability to attract prey, scare away predators, communicate or disguise themselves. Scientists have identified thousands of species of various luminescent organisms that use a total of about forty different chemical mechanisms to emit light. Most of these mechanisms have only been partially studied, or not studied at all. Decoding of the mechanism of fungal luminescence was made possible by years of preceding research in the field. Back in the early 19th century, it was discovered that it was mycelium that made rotten trees glow. In 2009, Anderson G. Oliveira and Cassius V. Stevani, co-authors of the present paper, determined that a single biochemical mechanism is shared by all fungi emitting light. In 2015-2017, a team of Russian scientists led by Ilia Yampolsky made a series of key discoveries. In particular, the team determined the structure of luciferin, the molecule that emits light when oxidized. While conducting their new study, the scientists discovered a set of enzymes that produce this molecule, as well as the luciferase -a light-emitting enzyme. “If you understand how a bioluminescent system works, you can put the necessary components in a test tube and see luminescence. An important stage in our work was to identify the principal enzymes of fungal luminescence: those that catalyze biosynthesis of luciferin and the luciferase. We succeeded using a combination of analytical methods which allowed us to ‘disassemble’ the entire system into its components,” says Konstantin Purtov, research fellow at the Institute of Biophysics in Krasnoyarsk and one of the researchers on the project. The fungal luminescence system turned out to be surprisingly simple. Scientists discovered enzymes that perform the “caffeic acid cycle” in fungal cells: a pathway for the biosynthesis of luciferin and emission of light. Activity of these enzymes necessary and sufficient for any caffeic-acid-producing organism to become luminescent. 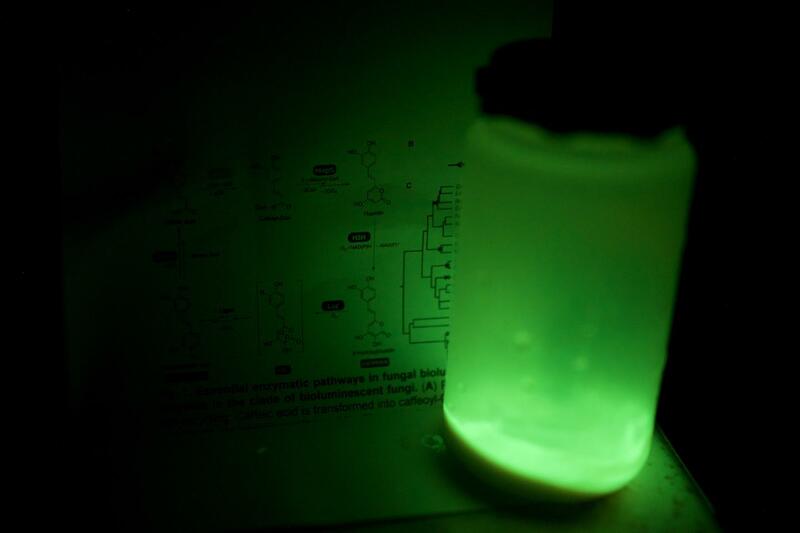 And if an organism does not contain caffeic acid, luminescence can be induced by adding two more enzymes, which the authors demonstrated by engineering a yeast strain that glows in the dark. “We have discovered in fungi the components needed to create a genetic module for bioluminescence; by transferring it from genome to genome, we can make virtually any organism luminescent, which has previously been an unattainable goal for researchers,” explains Alexey Kotlobay, the first author of the article, junior research fellow with the Laboratory of Chemistry of Metabolic Pathways of the Institute of Bioorganic Chemistry in Moscow. According to scientists, even though much has been understood in the genetics of fungal bioluminescence, the most interesting things still lie ahead. “The results of our study open up opportunities for new fundamental research, for instance, in fungal ecology or in the photophysics of enzymes, as well as for developing new molecular technologies,” adds Yuliana Mokrushina, junior research fellow with the Laboratory of Biocatalysis at the Institute of Bioorganic Chemistry, who shares the first authorship in the published article. The research was launched several years ago at the Institute of Biophysics in Krasnoyarsk when Nobel Prize winner Osamu Shimomura spent some time at the university under a “mega-grant” (Russian Government instituted monetary grants that are made available on a competitive basis to support of scientific research projects implemented by the world’s leading scientists at Russian institutions of higher learning). The subsequent pooling of efforts between Krasnoyarsk researchers and their colleagues from the Institute of Bioorganic Chemistry resulted in a breakthrough in the area of bioluminescence. The new system can be used for visualization of various biological processes, for instance, to tracktumor growth and migration of cancer cells, as well as for developing new pharmaceuticals. The work was done in cooperation with scientists from the company Planta, the Institute of Biophysics of the Siberian Branch of the Russian Academy of Sciences, the Institute of Theoretical and Experimental Biophysics of the Russian Academy of Sciences, Pirogov Russian National Research Medical University, Skolkovo Institute of Science and Technology, the Institute of Science and Technology Austria, the London Institute of Medical Science, the Centre for Genomic Regulation (Spain), the University of São Paolo (Brazil) and Chubu University (Japan). The theoretical and experimental parts of the study were supported by Russian Science Foundation. The results of the study are published in the journal Proceedings of the National Academy of Sciences.